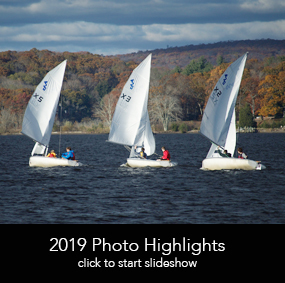 Greetings members and visitors to PYC's website and to the wonderful world of dinghy sailing, shell rowing and all things outdoors on the Connecticut River in Essex, Conn.
PYC is a seasonal yacht club beginning its "commissioned" year in May and ending in October. The club offers its members access to a special spot on the river across from Joshua's Rock, Brockway Island, Hamburg Cove and Selden Creek. Our sailing venue is a shallow (2'-4' at low tide), tidal basin about 10 miles up river from Long Island Sound, a great venue for dinghy sailors of all levels. PYC's clubhouse sits on the western shore of the basin between Essex and Deep River. The channel for regular boat traffic on the Connecticut River runs about a quarter mile away along the eastern shore. Here's to a great and safe 2019 season at Pettipaug. Paul Risseeuw Memorial Jr. Sailing Regatta on July 29 at Pettipaug Yacht Club. 53 junior sailors took to the water in 420s, O'pen BICs and Optimists. Have a great PYC/PSA photo? Send it with caption and photo credit to: studio@camerontaylordesigns.com.